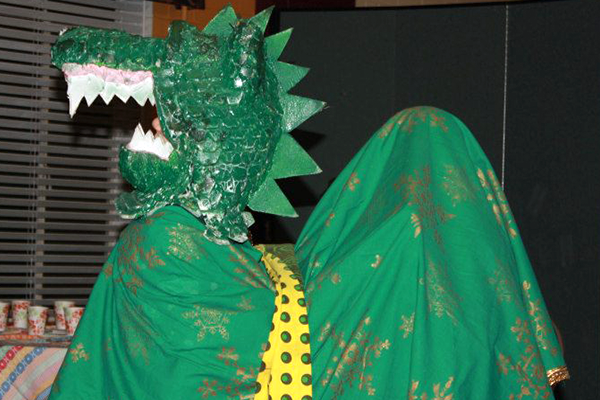 St. George is a traditional mummers’ play performed for centuries in the British Isles and colonies. 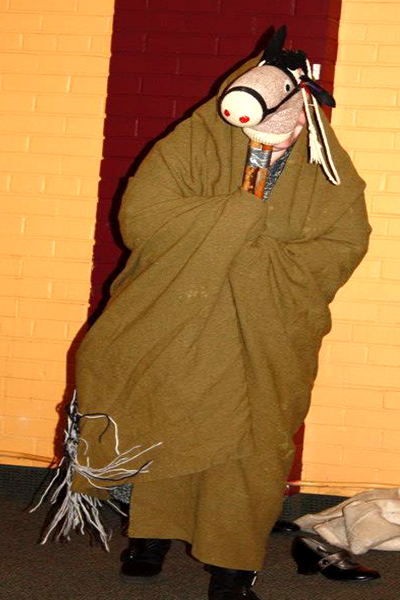 Mummers plays’ were an oral tradition; sometimes a role was passed from father to son, and performed for their entire adult life. Community members went from house to house to perform the play, and then stayed for treats and conversation. Our shared interest in old traditions became more active after our first child was born. At Christmas we formed a group of carolers, traveling to houses of professors and friends we thought would be pleased with our appearance. The first year they were surprised; the second year they were ready for us with treats and hot wine. We researched the sword dance, Morris Dancing, and mummer’s plays. We found pieces of the St. George play, which follows a classic Hero/ine’s Journey. St. George is a Christian hero, dying and being reborn. The play evolves from an earlier religion that observed the sun cycle, and is performed when the sun dies at Winter Solstice. It is part of the festivities calling the sun to revive the next morning, and take the season onward into spring. When Katherine Miller’s Saint George, A Christmas Mummers’ Play, illustrated by Wallace Tripp was published in 1967, it proved an amazing resource. This lovely book (still available) encouraged us to perform the play. We have acted our version at a Winter Solstice party for coming on 50 years. A fourth generation now participates in the play. As the Christians adapted the ancient sun play, we evolved the play over the years. the traditional “caller-in” character is Big Head or (our choice) Little Johnny Jack / Little Jilly Jackie. Father Christmas becomes Winter Solstice. Solstice is celebrated by all people, regardless of religious affiliation. References such as “England’s Knight” became “our Solstice Knight”. Lady Holly: Help, help, I’m stolen away. Won’t St. George rescue me today? Turkish Knight: It seems very important to not perpetuate the old enemy of the crusades, the “Turk”. We changed him to the Knightmare Knight, naming the fear rather than the object receiving the projection of it. Even the smallest children know the Knightmare Knight. The “Punch and Judy” like relationship between Lady Holly and the Doctor has evolved over the years, with the actors using the repeated exchanges of the dialogue to indicate a change from antipathy (first exchange) to being an affectionate team (third exchange). The horses fetched to help pull the tooth begin with the bravest small child. We repeat the fetching of the horses until there is a chain of children. The last horse can be the largest person at the party. The Beelzebub is a classic medieval characterization: the devil is more confused than evil, saying and doing things in reversed ways. The plot of the play follows the classic journey. With a band of actors at my back. (backie). Yet this play to you we bring. We hope your favor we shall win. Come in, Winter Solstice, and boldly begin. Tenemos, the place of transformation. Come in, Lady Holly, and clear the way. Lady Holly comes in with her broom, and sweeps open a playing space. The Hobby Horse is also called in, and settles down among the household. Road of Trials: The Dragon is first trial. (.. and Slasher is my name) St. George finally arrives to rescue Lady Holly. In some traditions St. George kills the Dragon, and in others vanquishes him. The Dragon represents the baser instincts, the Hero’s first task. After the fight they are both lying on the ground. Lady Holly: Get up, Saint George, our Solstice Knight. To waken the knight and make his heart jolly. A man of courage bold! I won a crown of gold. And by that deed I saved our lovely Solstice daughter. We’ll drag this Dragon out the door. If the Dragon is mastered, it can still go out the door, or be like a pet, resting and watching from the side of the action. In our version the youngest children are the Dragon, with the eldest carrying the head, and others under a long green cloth as the tail. We heave the dragon out the door so the children can come back and watch the rest of the play. The Knightmare Knight is the second trial. St. George is proud and boasting as the Knightmare Knight arrives. After the first exchange of insults, St. George is slain in a sword fight. Nigredo: St. George: My blood is shed by the Knightmare Knight. I die for Solstice and the right! The Solstice son (sun) is down – will there be a resurrection? To cure this deep and deadly wound. And the Hobby Horse becomes the Doctor. The doctor restores St. George to life. He picks up his sword, fights again with the Knightmare Knight, and this time wins. If God won’t have you, the devil must. Beelzebub in a very confused way manages to remove the Knightmare Knight. The actors bring the play to a close, and call out for their prizes from the household. Best source (still): Katherine Miller’s book Saint George, A Christmas Mummers’ Play, illustrated by Wallace Tripp, Houghton Mifflin Company, 1967. Ms Miller’s research is impressive. The book tells how a mummers’ band comes to a house, what goes on, and how people respond to the parts of the play. It contains suggestions for costumes and production. A play about May Day/Beltaine could feature Robin Hood and Maid Marion.